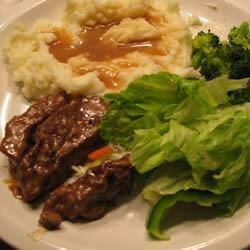 "Super tender, use a thin cut of round steak for better flavor! Extremely tasty, as it makes its own gravy." Trim the fat from the steak, and cut into desired number of servings. In a roasting pan over medium high heat, sear both sides of the steak, about 1 minute per side. Remove from heat. See how to make a tasty Southern staple: chicken-fried steak and creamy gravy. I used Lipton onion soup mix instead of condensed. With 3 cups of water with the soup mix we had oodles of gravy. Quick and easy dish that tastes excellent. Family says "keeper". This is a delicious recipe. I used dry onion soup mix and added two soup cans of water, instead of a can of French Onion soup. It's less expensive and the flavor is wonderful.